In October & November 2017, eight staff members from the Jewish Community Center of Greater Kansas City traveled to Israel on a 10-day trip led by the JCCA (Jewish Community Center Association). These are their stories. As someone who prides himself on being knowledgeable about world events, politics, geography and history, I was stunned at just how much I didn’t know about the State of Israel. 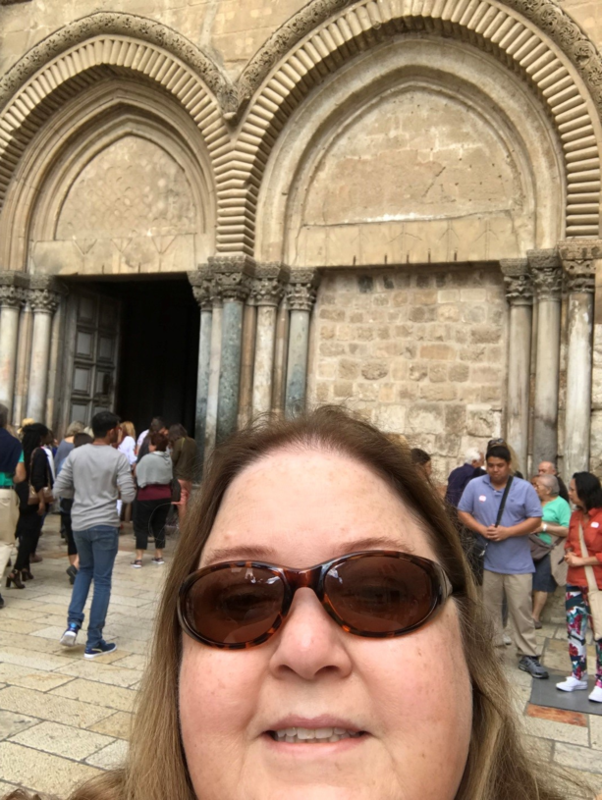 I was in awe of the tranquility of the desert, the beauty of the Mediterranean Sea, the mystical nature of the Dead Sea and Masada, and the diversity and history found in Jerusalem. One can view these sites on a map, but you can’t truly appreciate the magic until you’re there in person. It may be common knowledge that Israel is roughly the size of New Jersey. But, when you stand on a hill in the Judean desert, and by night can observe the lights of both Jerusalem and Amman, Jordan, it becomes clear just how small Israel is and why issues such as security and peace negotiations are so critical. Since returning from Israel, dozens of individuals have asked me what was my “favorite part of the trip.” I’m very pleased to share. Yet, this question is quite challenging! Do I really have to name just one thing? So many experiences were all special, unique and memorable! How can you compare the 5,000+ years of history and culture in Jerusalem, to the modernity and progressiveness of Tel Aviv? How can you choose between the intrigue that comes from experiencing the vastness of the desert, to the majesty of the mountains in the north? Or, select which is better—the liveliness and spirit on the Mediterranean, or the thought-provoking void of life in the Dead Sea? So, if I must answer the question I’ll give it my best attempt. My best take-away from this trip to Israel was the truly deeper understanding of the land, the people and the culture I obtained. The trip, you see, was more than a sightseeing tour. The well-conceived itinerary was designed to allow participants to experience exactly what the State of Israel was, and is. When seeking to understand what the State of Israel is today, you rapidly learn that this is no easy task. In the United States, we inhabit a country that has existed for a little more than 240 years. Even going back to Plymouth Rock, we have about 400 years of history. Jerusalem, on the other hand, was founded more than 5,000 years ago. Thus, there’s an almost inconceivable amount of history to grasp. In some regards, the trip was exhausting, as I often wondered just how much knowledge I would be able to retain from the multitude of ponderings we had with our Tour Educator. The discussions were at some points very sad, as when we visited Yad Vashem, Israel’s official memorial to the victims of the Holocaust. At other points, the educational conversations were both informative and inspirational, as we learned the history of Tel Aviv and how this city rose from ‘nothing’. And, many times, the topics were stimulating as we struggled through controversial subjects including the politics of the Wall, settlements, security issues and the ongoing peace process (or lack thereof). 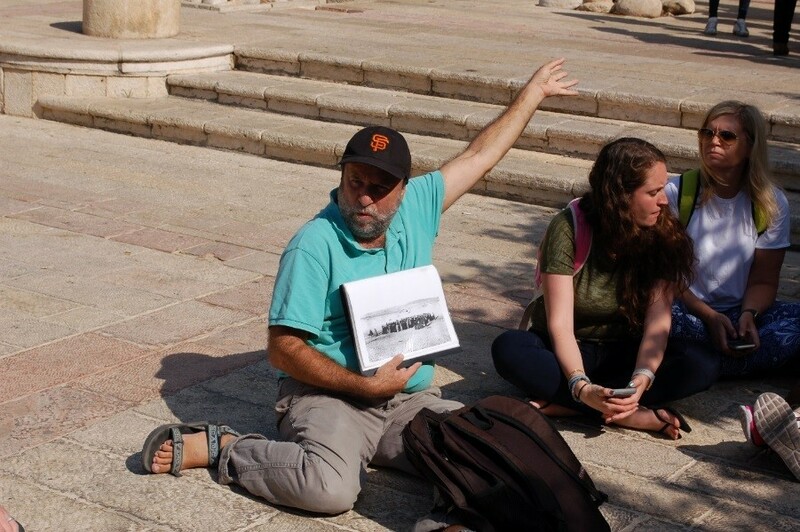 We not only traveled the land; we “touched” the land,” because, as our Tour Educator, Abraham Silver would often remind us…you won’t truly understand Israel until you’ve “touched” and experienced it first-hand. He indeed was right. Whether it was touching the Western Wall, taking a dip in the Dead Sea, hiking up Masada, playing in the desert or simply picking sweet potatoes for the homeless, we learned to appreciate the land, and the State of Israel, in a significant, memorable and inspiring manner. The trip impacted me both personally and in my role as President & CEO of The J in a profound way. Hundreds of questions remain for me, but the one that is foremost on my mind is: When do I get to go back? For me, it was the beauty and solace of the desert that brought a personal, spiritual inspiration. So vast and unchanged for thousands of years. Who could help being filled with awe and wonder? In the morning, we stopped at the village of Sde Boker in Mizpe Ramon to visit the graves of Paula and David Ben Gurion. He was the primary national founder of the state of Israel and the first Prime Minister of Israel. The desert was very important to them. So important that they chose this place to be laid to rest with a view overlooking the Zin Canyon. In my photo, I'm sitting on the edge, quite comfortable in my shorts on this winter day in Israel, with a view into the Zin cliffs and canyon. This part of the desert contains the path that Moses took while leading the Hebrews out of Egypt after the Pharaoh finally let them go. To be in this space where such amazing and important historical events happened, was truly inspiring. We were advised to watch out for scorpions and snakes, but fortunately instead we were entertained by the Nubian ibexes in the national park where we were. They liked to play in the desert garden and looked much like antelope or deer. They are a very graceful and peaceful animal. They were very fitting for our desert experience. Early that afternoon we visited the Machtesh Ramon (crater) in Mizpe Ramon. It was once a large mountain set on a fault line. An earthquake caused the top to fall in. The rain came, and the water rolled down the side causing the area to flood and sink, thus forming the crater. This is the largest of three Negev craters. From the top, you can view Jordan in the East, and Sinai in the west. It was overwhelming to be in this land where David, Moses, and Jesus had been searching for God, and seeking inspiration of their own. Elijah also came searching for God. He was disappointed when couldn't see God but only the emptiness of the desert. As Elijah sat waiting, a breeze came over him and he knew God was there. God was in the still, soft wind. He was meant to be heard not seen. The quiet, open, sunny desert is where God chooses to be with us. It is a place open to everyone who will listen in the stillness, much like the Torah is for anyone who wants to receive it. As we sat hearing this message from our guide Abraham, a cool breeze blew around us, and I knew God was there with us too. I would like to bring this idea of listening for God in the stillness. In our busy suburbia life, we often don't make time to go into nature and be quiet, really quiet, and listen for inspiration and comfort from God who is always there. A God who is there for anyone who wants to come and listen in the desert. The focus of my trip was finding what I can share with my very young students to help them get to know and appreciate Israel. I wanted my students to be involved in my trip from beginning to end, so I asked each class what they thought I would see in Israel. I took a spreadsheet of their responses and checked off items that I found. One of the most memorable parts of the trip was the wonderful group of JCC members from around the US. They were all so excited to help me check things off my list. I also set up a map and itinerary and sent daily pictures so the children could follow along where we were. Our tour guide, Abraham, was a walking encyclopedia of Israel from biblical times to present. He told us so many amazing stories and facts, took us so many fascinating places, that is was extremely difficult to choose one thing that was especially meaningful. Tel Aviv is such a modern business center full of skyscrapers, lots of traffic and the beautiful beach. Amazingly, started on a sand dune outside Jaffa by seventeen year olds. Jerusalem, ancient and new, the holiest sites for three religions, the Shabbat experience, so much Jewish history. The Negev and Judean deserts, home of Abraham, Moses and the people’s journey, the scene of major earthquakes (I had never heard that Israel has a major fault line running through it or dormant volcanoes), and, of course, Masada and the Dead Sea. Floating in the Dead Sea comes in second as the most memorable thing we did. My favorite part of Israel is the north. Lake Kineret is huge and beautiful, Tsafat, the birthplace of Kaballah, so hilly and so many stairs, the Golan Heights under UN control, reached by going down a road lined with fields that are still full of live mines (!) and the lovely winery we visited. 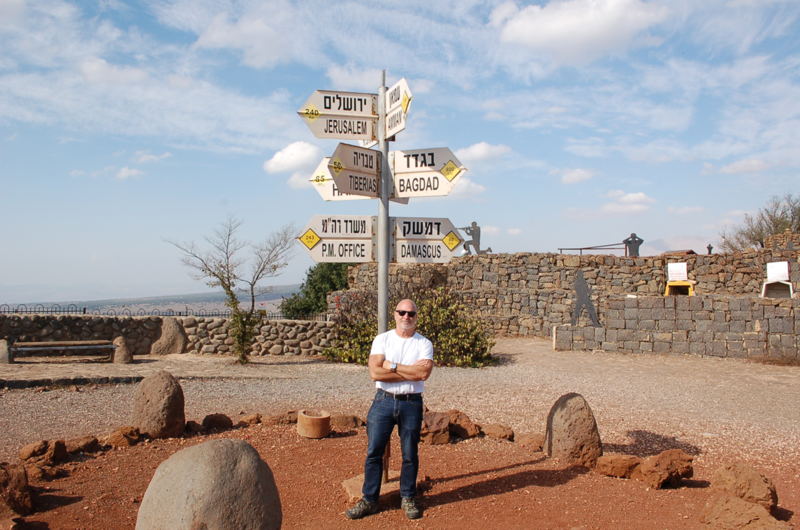 All of these places were fabulous and meaningful, but the photo I chose has two of my favorite parts of Israel. 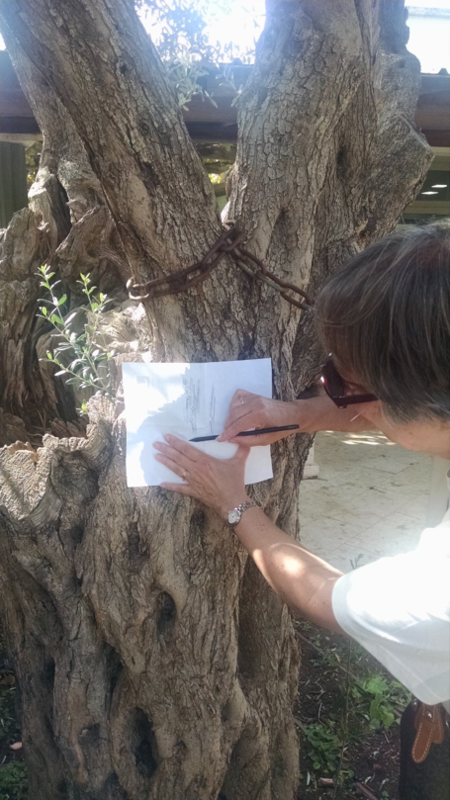 My photo is me doing a pencil rubbing on a beautiful old olive tree in Tzipori National Park. The olive tree is a symbol of Israel that we talk about a lot for various holidays. It’s large, gnarled trunk reminds us of the strength of Israel and its long history that has certainly had some bumps along the way. Olives are delicious and they also give us oil – what would Hanukkah be without the miracle of the olive oil lasting for eight days. The olive branch is the symbol for peace that Israel strives for and we all need to work together on. The wood of the olive tree is used to make beautiful pieces of art for us to enjoy. The wood itself is so like Israel, dark and light with lots of grain lines showing the diversity and strength of the people. I brought back a camel made of olive wood to show the children and explained how each piece of art was different looking even though the wood came from the same tree. Tzipori National Park is my favorite place to visit with the ancient mosaics and old Roman roads with the children’s games scratched in the stones from so long ago. The intricate beauty of the mosaics in the old synagogue and the house of a wealthy family leaves me in awe. How did the artist in those ancient times create such detail and how are they still in such good shape that we can still appreciate them today? I can’t wait to do some mosaic art with the children and show them pictures from the Park. I hope through art activities, stories, pictures and items I brought back, the children will feel a connection to the land of Israel and its people. As one might imagine, traveling to Israel for the first time was an almost surreal experience. Every day, indeed, almost every hour, brought a new revelation or insight; virtually every step of the journey created a memorable moment. That said, one of the most pervasive themes of the trip – for me anyway – was that Israel is a study in imperfection and contrast. It is a place where any given day can bring strife and conflict, yet Israelis appear to be almost universally cheerful and happy – where lush, green landscapes coexist beside harsh desert-like terrain – where a peaceful park-like setting in a suburban settlement displays unused armored vehicles and tanks as if they were children’s playground equipment -- where a site like the Western Wall can be a place of somber prayer at one moment, and effervescent jubilation later that same night for Shabbat. However, the portion of our trip that embodied this juxtaposition the most for me was our sojourn through the Golan Heights. For in this small section of what was once Syria, we experienced the harsh realities of war -- and the joys of hearty food, fine wine and good fellowship in an idyllic setting -- all in the course of a few hours. As our bus climbed the curving road into the mountains, we left behind the beautiful lowlands of the Galilee and arrived high up on the slope of the inactive volcano that is Mt. Bental. We hiked to the top of the mountain, observing the trappings of a modern-day military outpost every step of the way: stone bunkers and trenches, gun emplacements, and yard upon yard of barbed wire barricades. From the top of the mountain, we could see to the east the fence/wall separating Israeli-occupied territory from the war-torn land of Syria. Beyond that fence, we could discern a deserted town, emptied of life by the current factional strife in Syria. Nestled against the opposite side of the mountain, was the antithesis of that deserted town: a thriving kibbutz, surrounded by trees and lush vegetation. As some members of our group posed for pictures with the U.N. observers at their post overlooking the border -- almost as if the peacekeepers were costumed characters in a theme park -- our tour educator recounted the strategic importance of the Golan Heights, and of this outpost in particular. He shared the story of the opening battle of the 1973 Yom Kippur War, fought just below us, which pitted a 29-year-old tank brigade commander, Avigdor Kahalani, and his 60 tanks, against a Syrian force of over 1,200 tanks. Over the course of the next fifteen minutes, we learned how, against seemingly insurmountable odds, the IDF tank brigade, in outdated tanks manned by little more than teenagers, miraculously emerged victorious, repulsing Syrian forces long enough for reinforcements to arrive and re-secure the region. It was a sobering story, punctuated by the sounds of artillery fire in the background, as nearby IDF forces conducted military exercises. Thirty minutes later, we found ourselves stepping down from our bus into what could have easily been mistaken for a Napa Valley winery. The Golan Heights Winery proceeded to treat our group to a wonderful tour of the facilities -- rivaling anything one might find in California’s legendary wine country – followed by a sumptuous lunch, featuring delicious local fare, and of course, several flights of their Yarden wines (a Chardonnay, a Cabernet, and a dessert wine). As we sat around the huge banquet table in their rustic-yet-luxurious event space, passing delightful dishes, sipping glorious wine, laughing and chatting, I found myself thinking about the incongruity of this scene with battle that had been fought a mere handful of kilometers from this place, a battle so fierce and awful that the derelict tank-strewn terrain had since been labeled the Valley of Tears. Yet it seemed somehow perfectly fitting that so much laughter and joy could be taking place so soon after our visit to a site of such strife and war… for to me it represented a microcosm of the puzzle that is Israel: a land of war and peace, of arid desert and lush gardens, of improbable victories and great tragedy, of ancient sites and technological wonders, of reverence for tradition and embracing of innovation. In short, a land that embodies the complexity, struggle and imperfection that is the essence of the human experience. John Updike once said that “perfectionism is the enemy of creation.” My journey through the Holy Land reinforced that concept in a visceral way that I hope I will carry through all of my creative endeavors here at the J.
David Ben Gurion was born in Poland in 1886, and learned about Zionism from his father at a young age. He moved to Israel, which was not yet Israel, in 1906 when he was just 20 years old. He worked on a kibbutz, dabbled in politics, and eventually went to Constantinople to study law. He was living in Jerusalem at the start of WW1, but was deported and eventually made his way to America where he met and married his wife. They returned after the war and his political career really began. For the next 30 years, he worked to establish a Jewish presence in the British ruled government. He was instrumental in forming a parliamentary system and creating a Zionist party. We visited Independence Hall in Tel Aviv and saw the room where Ben Gurion declared the independence of the state of Israel on May 14, 1948. We actually heard his words as he did so. He served as Prime Minister of the state, as Defense Minister. He was responsible for the National Water Carrier system, oversaw the immigration of thousands of Jews to Israel, and was passionate about turning the Negev into a working agricultural area. When he stepped down from politics in 1963, he moved to a kibbutz in the Negev desert. He died in 1973 and is buried next to his wife at Midreshet Ben Gurion, near his home on the kibbutz. The walk to his gravesite is filled with the beauty he dreamed of, with olive trees and wildlife, all in the middle of the desert. Midreshet Ben Gurion is a desert research center where they work on agricultural and biotechnology research. The reason this picture connected with me so much is that I realized for the first time that David Ben Gurion was alive in my lifetime. He was not involved in politics any more, but knowing that gave me so much more of a connection to Israel and made me feel as though I belonged there. That feeling of connection is not something I’ve always had being a non Jew working at the J. I love my J family and feel more than ever now, that I belong there, and I’m where I’m supposed to be. Just like David Ben Gurion moved to Israel and discovered where he was supposed to be. This photo was taken the morning of our first full day in Israel, which was spent exploring Tel Aviv on foot. During our walking tour, we stopped often to hear about the city’s history. When this photo was taken, our group was learning about the events of April 11, 1909, when 66 Jewish families gathered on a sand dune to divide the land of future Tel Aviv. Tel Aviv was developed with great intention and much thought about its current and future state. That’s what made an impression on me. My impression about most cities in America is that they grew organically and sometimes – like during the Gold Rush –at a frantic pace spurred by greed and competition. Tel Aviv, in contrast, was envisaged as a clean, modern city with up-to-date amenities and a well-planned, meaningful design. This prompted me to think about the culture of The J and how we can shape it with intentionality and an eye on our current state and long-term goals. The founders of Tel Aviv decided that they valued hygiene, convenience and beauty above other attributes and built accordingly. We can do the same at the J. We can decide we value diversity, inclusiveness, kindness – whatever we choose – and then deliberately, thoughtfully put into place what’s needed to move toward that ideal. As an HR professional, I think about how this trickles down to hiring, training, developing and rewarding our staff members. For most of our drive through the Negev, the scenery was a vast difference coming from the city life of Tel Aviv. The yellowish-tan sandy mountains’ stretching out in all directions was quite beautiful and serene. It was a landscape that is unique from many other parts of the world. 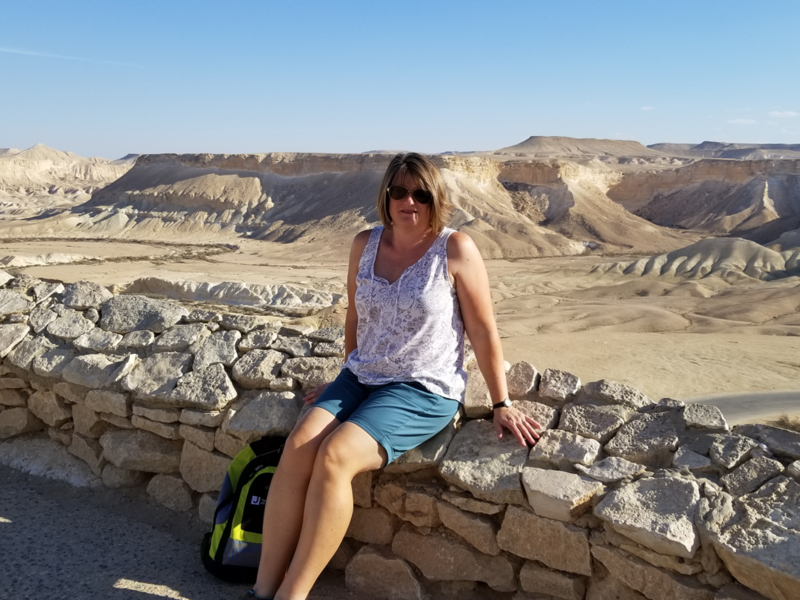 Our journey through the Negev, which covers over half of Israel’s total land area, gave us insight and understanding of the many dimensions - its history and myth. We had a chance to climb Masada and learn about the extensive excavations of Herod’s fortress above the Dead Sea. The Dead Sea known in Hebrew as Yam Ha-Melakh (the Sea of Salt) is the lowest point on earth, surrounded by the stunning landscape of the Negev Desert. It is called the Dead se because it has the highest concentration of salt of any body of water in the world and prevents the existence of any life forms. We also learned about the changing structure of the sea which is shrinking from mineral mining and evaporation. It was an amazing experience getting to float in the Dead Sea and learn about the renowned health and healing properties that it provides. One of my many favorite moments on the trip, one that especially stands out, is the Ramon Crater, known as the Makhtesh Ramon. It’s a giant crater in the Negev Desert that is often compared to the Grand Canyon in the United States. This geological crater in the Negev desert is shaped like an elongated heart. Today, the crater and surrounding area form Israel's largest national park, the Ramon Nature Reserve. To me, it had the most stunning views and a calming, peaceful ambiance. It was truly breath-taking and a site to behold. My first impression of this massive crater in the Earth is that some huge meteor impacted at some point in history. However, I learned that the crater is the result of millions of years of water erosion and climate change beginning from a time when oceans covered the now desert area. The crater is 500m deep with the deepest point being Ein Saharonim (Saharonim Spring) which also contains the Makhtesh's only natural water source, which sustains much of the wildlife in the Makhtesh. 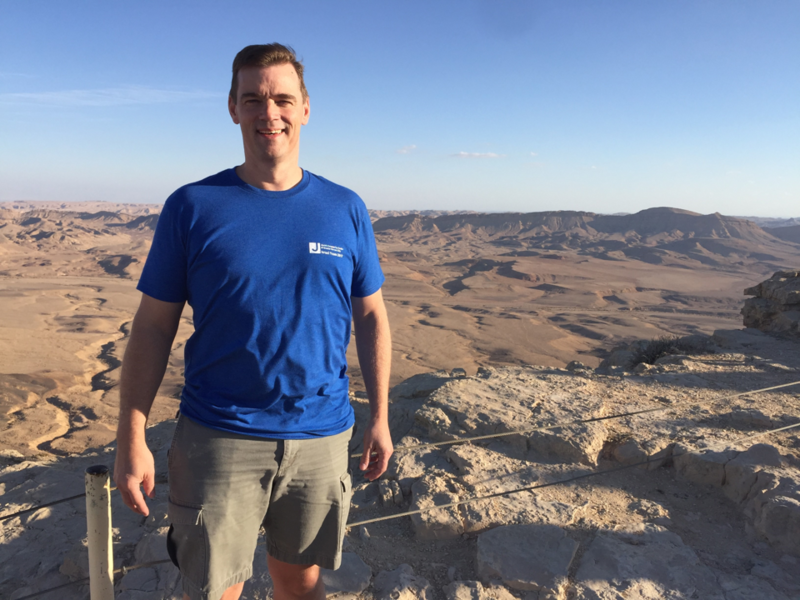 In my picture, I’m standing on a ledge overlooking the Ramon Crater, the gigantic canyon that gashes through the heart of the Negev. The rich, vibrant colors, shapes, layers and textures were beautiful to behold. As we looked out over the vast expanse and soaked up the natural splendor, the sun was setting on the rich Makhtesh Ramon. I found this not only to be one of the world’s geological wonders, but a dramatic site in Israel. I feel lucky that I got to experience this desert scenery, and even more so because it was not on the original agenda. 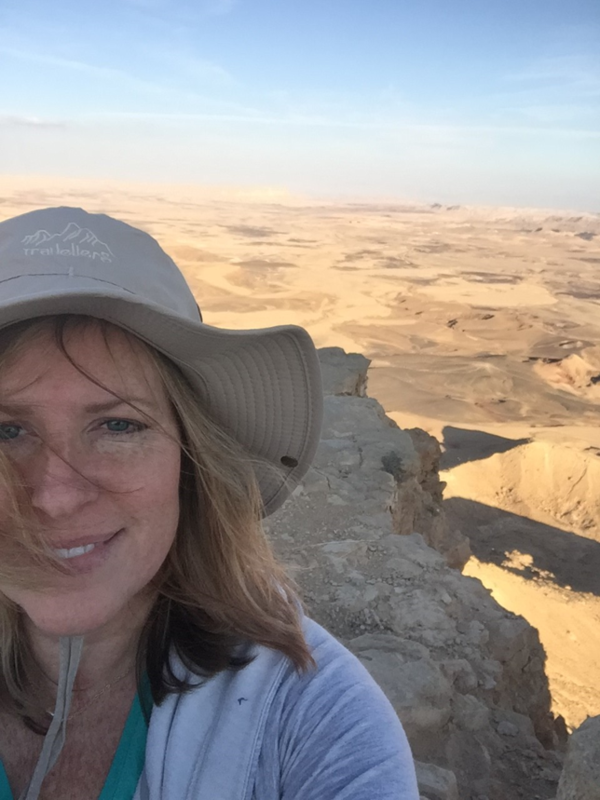 The Negev desert felt like a sacred space, a time to reflect, a time to allow for calmness, a time for being mindful. I hope to instill this tranquil feeling through pictures and stories and share the experience with others so they too can instill a special sacred space within the J environment. Israel’s Negev Desert was like pure magic; a fascinating and enchanting place. At first thought, the word desert sounds so unappealing. It brings other words to mind like barren, dry, hot and sweaty…all unpleasant, right? Wrong! On day 5 of my Israel journey, the beauty of the desert was before my eyes and became one of my favorite places. There was no green grass or tall oak trees but it felt very comforting and almost like home. Maybe this is because I lived in the Arizona desert for the first 7 years of my life. A more likely answer is the magic of being in Israel. You know the kind of nostalgic moments that recall a memory from your childhood? While in the Judean desert, I could remember the severe dryness of the Arizona ground and the tumble weeds that rolled along in the wind. I could see the Santa Theresa mountains in the distance emerging from the desert plains. It was an unexpected memory looking from the top of Masada out at the dead sea and the mountains beyond. Who knew my nostalgic desert heritage would come alive in one of the least likely of places, Israel. 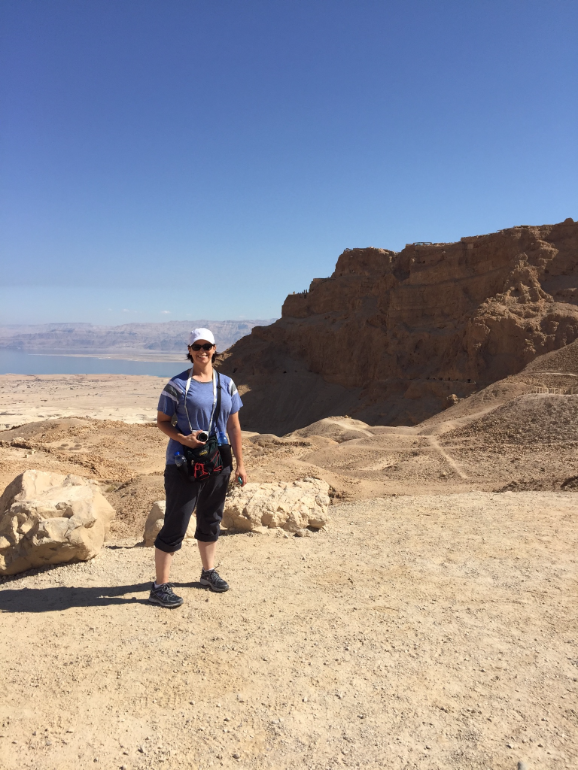 As an ancient fortress palace built by King Herod in southern Israel’s Judean Desert, my Masada experience represents so many things that I enjoy…the outdoors, hiking, scenic views, archeological discoveries and a great story. Not to mention the beautiful mosaics that this home improvement junkie can only imagine having in my modest 1,400 square foot fortress palace in Kansas. When you live in the Midwest, history rarely seems to go any further back than the early 1800’s A.D. but Masada dates back to 30 B.C.E. Until Israel, I had only read of King Herod in the bible. Now I was seeing with my own eyes, feeling with my own hands and beginning to understand why it is an important symbol to the Jewish people. Masada is a testimony to strength, innovation, prosperity, preparation and conviction…all qualities worthy of striving. The picture shown with this essay is of me beginning my ascent up Masada, the start of a journey. Traveling abroad seems to take me on journeys in ways that have an impact on me in unexpected ways. I don’t get this in other travels. When in India, I fell in love with the people and colors. When in Costa Rica, the food and landscape were incredible. In Israel, it was everything. The food, the people, the landscape, the history, the emotion, the conflict…everything. 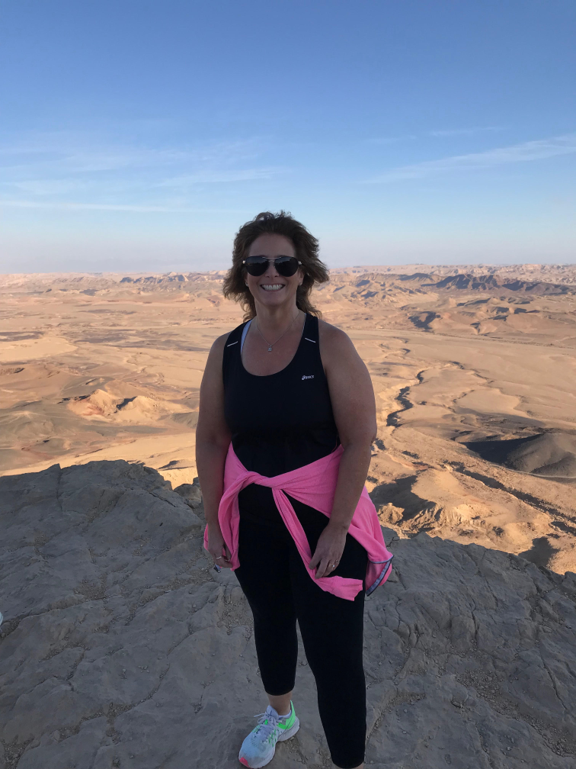 As I hiked to the top of Masada, I felt the physical challenge of muscle burn and the sensation of being out of breath. But it was the good kind of burn that you know is good for you and will be well worth the struggle. The struggle of a journey always seems to conclude with the best rewards. I’ve experienced this in working at The J. In 2017 I happily concluded a year-long process to prepare the Heritage Center for reaccreditation. It’s great to be done and accomplished. But it was the journey that was most important…that’s where the change happened. In the coming year, my hope is to engage in more journeys both professionally and personally that may not be easy but are well worth the effort. Author Henry Miller said, “One’s destination is never a place, but a new way of seeing things.” I feel Israel has given me new sight. I see a little better, feel a little deeper and understand a little more. The experience will undoubtedly impact my work with greater strength, innovation, prosperity, preparation and conviction in all I do.